We’ve got a few visitors this month and next month. First up, Shawn and Maggie stopped by with Maggie’s family for a one-week tour of Japan . They hit the major cities like Tokyo , Osaka , Kyoto and more. We hung out with them a few days and generally showed them around Tokyo a bit. We spent a large chuck of time in Akihabara in the mega electronics shops (not surprising, I know!). We had a lot of food, too, of course! Sushi, soba, yakitori and more! 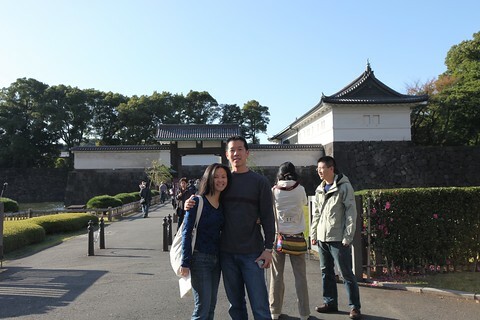 Next, Kevin and Kathy made a stop in Tokyo on their way to Thailand for their honeymoon! We did some karaoke, had some soba, hit a few izakaya, took them to the Imperial Palace Gardens and Meiji Shrine. This month and in particular November 15th was the Shichi Go San (7, 5, 3) festival celebrating children turning 7, 5 and 3. They dress up in kimono and go with their families to shrines to pray. The little girls in kimono were especially cute! There was also a chrysanthemum display at the same time. And of course, there were weddings going on at Meiji Shrine! Check out the bride’s hair! I’m not sure if it’s her real hair or not but it looks SOLID! Henry took them to Kamakura for a bit before they continued their site seeing of Tokyo on their own. Later that night, we met up for roasted miso/soy sauce ramen whose broth basically looks black. Ok, perhaps charred is a better description. In any case, the ramen was yummy and the noodles were quite good. We had a few visitors this month and more coming next month. First up, Shawn and Maggie stopped by with Maggie’s family for a one-week tour of Japan. They hit the major cities like Tokyo, Osaka, Kyoto and more. We hung out with them a few days and showed them around Tokyo a bit. We spent a large chuck of time in Akihabara in the mega electronics shops (not surprising, I know!). We had a lot of food, too, of course! Sushi, soba, yakitori and more! 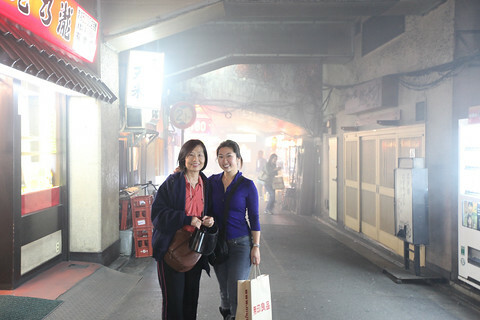 Check out the smoke filled Yakitori Alley. Maggie's family stayed at the hotel above the Shibuya train station so they had a great view. 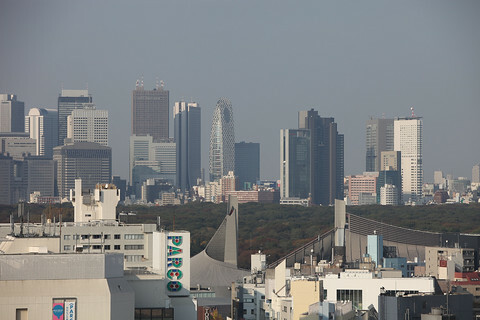 Here's the view towards Shinjuku with Yoyogi Park in between. 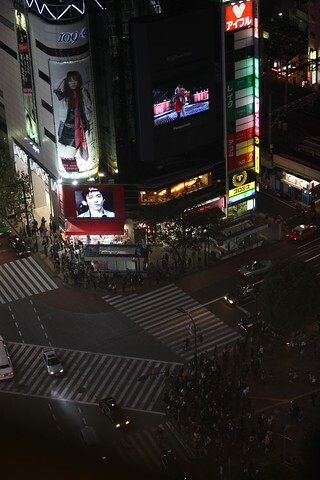 Here's a night view of people about to cross the Shibuya Scramble. 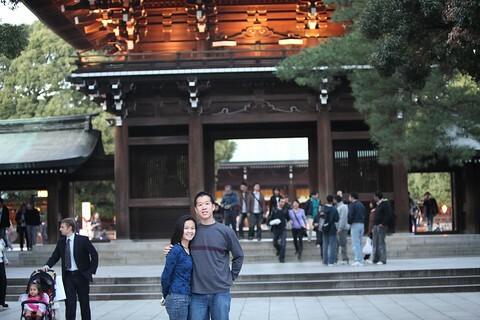 Next, Kevin and Kathy made a stop in Tokyo on their way to Thailand for their honeymoon! We did some karaoke, had some soba, hit a few izakaya, took them to the Imperial Palace Gardens and Meiji Shrine and then Kamakura. Henry took them to Kamakura for a bit before they continued their site seeing of Tokyo on their own. 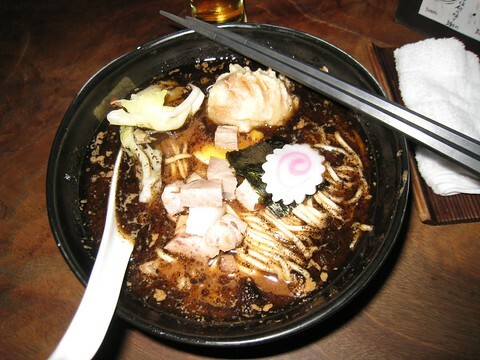 Later that night, we met up for roasted miso/soy sauce ramen whose broth basically looks black. Ok, perhaps charred is a better description. In any case, the ramen was yummy and the noodles were quite good. Henry had his with a deep fried whole egg.